Mighty Machines. At The Construction Site. 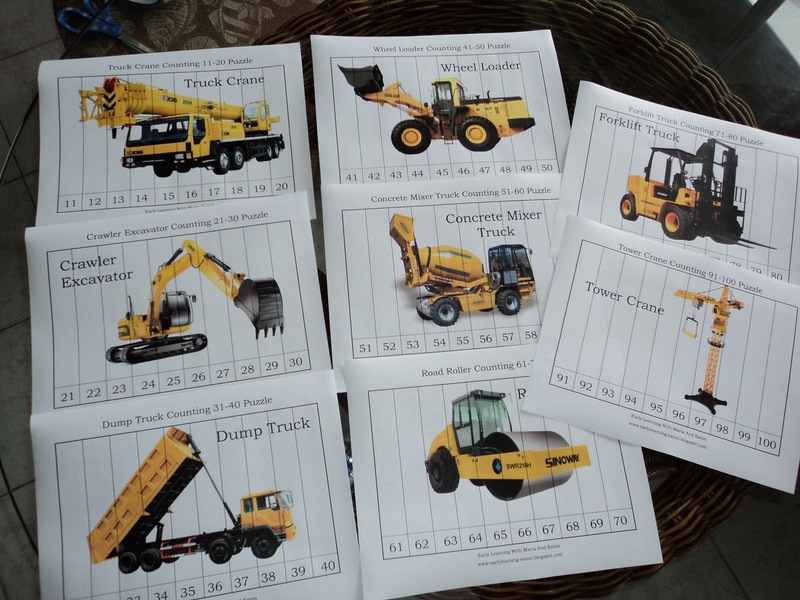 I made this set of printable puzzles for Eaton because he loves all construction machines. I wanted to work with him on counting and this idea seemed pretty appealing as he already owns similar alphabet train puzzle. The alphabet train puzzle works great for Eaton. He puts them together every day so I decided to make similar one for counting. This is the first day I introduced that puzzle to Eaton. I was helping him to put pieces together and to show him how to start. Eaton was focused more on reading the label "Bulldozer" than on a sequence of numbers. Marta What a creative idea !!! I’m sure it’s a great fun for Eaton - he is such a smart kid. I hope your puzzle will keep my older one busy while waiting for the Santa Claus arrival. I’m not sure if you notice it but the file is incomplete. It misses the part from 81-90. I would be grateful if you could upload it. Once again all the best to your family for this holiday season. PS. EFL means English as a foreign language. PS. Few years back, in Poland, ESL abbreviation was more popular. I haven't seen dthis idea before! !It is way cool!! I can't wait to make some for C.Thanks for sharing! I can not find where to download the puzzle with the machines? 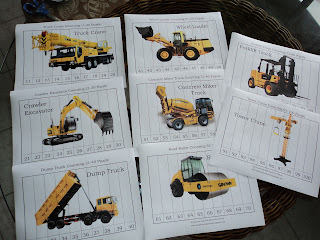 Hi hi, my daughter is a construction maniac too...was really hoping to print this file but the link doesn't seem to be working. mind sending it to my email please? i'm at janicewong27(at)gmail(dot)com. Thanks in advance!